On Tuesday 5th April students in 8W1 & 8W2 + staff hosted a family science evening where students applied their science learning, by teaching others. 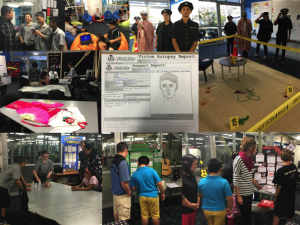 A range of interactive stations were set up within Water Whanau to promote learning and enjoyment of science – Mrs Kent’s English class even set up a crime scene investigation! The evening successfully showcased science learning across the curriculum and shared information + tips detailing how families can support Term 2 Science Fair investigations.